This tiny gray store at the corner of Old Georgetown Road and Greentree Road in Bethesda, MD has been around forever (Actually "only" since 1924). For some reason, when I was a kid it was called "Browns" although I never knew why (was the owner named Brown?) 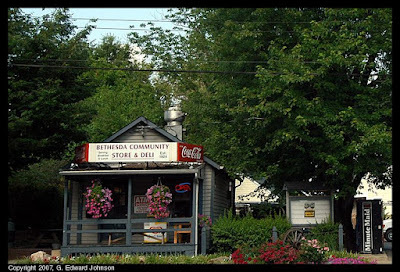 Even back then it was called Bethesda Community Store and was painted gray. For some time, the current owner, Arnie Fainman, has been trying to expand. Earlier this year the Montgomery County Circuit Court ruled that the store should "be preserved and that its economic viability be protected to enable to continue in operation as a ‘store.'" This opens the path for him to expand. Any plans still have to be approved by Montgomery County Historic Preservation Commission and in the past expansion has been opposed by the Huntington Terrace Citizens Association saying it represents an unwanted commercialization of the area. They haven't decided if they will continue to oppose the expansion. Fainman wants to allow the Salt River Lobster company to continue to sell seafood on the store's property, and to be able to turn the storage shed into a permanent building expansion. There is a whole lot more information at the Gazette. I live in HT and while I don't want a gas station or a 7-11 on the property, I support keeping "The Fish Guys" at the Bethesda Community Store. It is the coolest thing about living here. I've never posted anonymously anywhere, but had to in this case. Hi, thanks for taking the time to comment. Based on the article in the Gazette, I think that your fears are unfounded. Here is my understanding on this. Feel free to post a follow-up comment if I get something wrong. * The property is currently zoned residential with an exception for the historic store. * The owner was issued a citation for allowing "The Fish Guys" to use his property and for the storage shed. * The owner says that for the business to be viable he has keep "The Fish Guys" there as well as add more square feet (including, but, it appears to me, not limited to making the shed permanent). * On the second appeal he prevailed, which should mean that he can keep the fish and possibly expand without re-zoning it commercial. I honestly can't see any way that the owner could put a 7-11 or gas station on the property while keeping the residential zoning and getting approval from the historic preservation commission. Even if he continues with the re-zoning application (the article didn't mention if he plans to or not), he would still have to deal with the historic building. I also think that his idea to add a farmers market would be nice. We called it Browns, too, when I used to go there to buy baseball cards in the late 60s. I don't know why. That's a great news! Bethesda people are now excited of this store expansion! Love to shop there. One of the owners was Ernest Brown. Why that name stuck is beyond me. We frequented the store as kids in the '60's and 70's. I'm happy to see that it's still around. I shop there when I'm back in Bethesda.